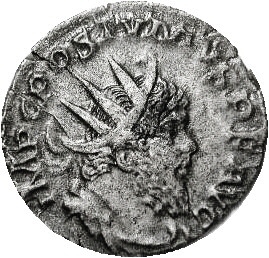 Kushan - AE Tetradrachm - Vasu Deva I, 192-225 A.D.
13) Previously appointed Commander of the Rhine legions by the Emperor Valerian, this Gallic usurper rebelled against the Emperor Gallienus, and assumed Imperial rule in Gaul, Spain and Britain... a) what was his full Latin name? He was successful against the Emperor Gallienus, and apparently ruled well for several years but, in AD 268, a Legionary Commander called Laelianus rebelled against him, hoping to rule instead - b)in which town was Laelianus based? ( give the Latin name pls.) Laelianus was soon defeated but our Usurper shown above would not let his troops sack that city - c) in which modern day country is that city.